How to get back contacts once deleted email account on iPhone? How to get back contacts once deleted email account on iPhone? How to recover iPhone lost contacts because of email deletion? Read here to retrieve lost contacts. I deleted my outlook/exchange account from iPhone 5 to which all my contacts were synced. Is there anyway I can restore my contacts or may be restore my account to get back my contacts? I had no idea that if syncing iPhone to Windows PC, the contacts are automatically synced to the exchange account. N now when I have deleted my account I have lost all my contacts. I tried iCloud but the contacts have been deleted from there too. Please help me if there is any chance to get back lost contacts. Just as the description above, how to get back lost contacts once deleted email account on iPhone? Some people will sync contacts with their email account so that they can keep them on computer also. But sometimes, accidents just happen when you delete email account on your iOS device, for you will also lose those data stored on email account. Thus, is there any chance to retrieve iPhone lost contacts due to email account? Just calm down and keep reading. In order to recover lost contacts from iPhone because of email account deletion, you may try a professional iPhone contacts data recovery tool--iFonebox. As is known that iFonebox is a professional iOS data recovery tool which can not only recover deleted or lost text messages, contacts, notes, wechat messages, etc, from iPhone or iPad directly, but transfer found contacts back to your iDevice directly. Also, if you have an iTunes or iCloud backup for deleted contacts, iFonebox enables you to extract and retrieve contacts from backup selectively, without wiping any data on your iDevice, so amazing. Next, I will share detailed steps to help you get back contacts lost on iPhone at ease. Preview and select lost contacts to recover. Now you have the chance to view those scanned contacts and then, select them, click Recover to Device button to transfer all found contacts back to your iPhone directly. The deleted contacts will be in orange. You can choose only display the deleted items. That's it. 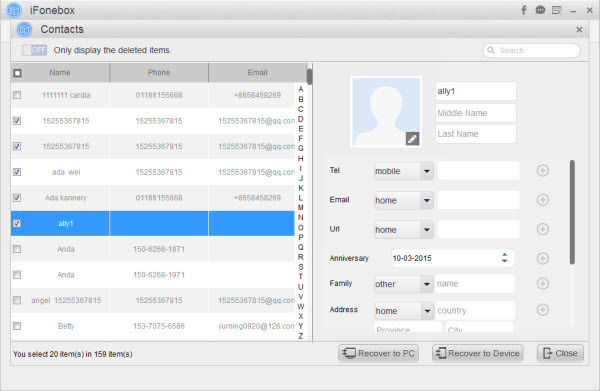 In short, it is quite convenient to retrieve lost contacts back to iPhone when delete email account via iFonebox. PS: choose Recover from iTunes Backup or Recover from iCloud Backup to get back lost contacts to iPhone selectively if you have the backup data.